I wrote a blog post about how to detect and resolve collision between a moving object and a stationary object using 2D axis-aligned bounding boxes. Hopefully someone finds it useful. Let me know if you have any questions or comments. I dont have the time to read the whole post now but ill do it sure ! I've added it to my useful-links list on Github. If you don't like that, I'll delete it again. Ah. You stated you'd like a primer on the two-moving-objects matter (sphere-sphere with code). There is also polyhedron collision that can be done which can be specialized to replace 2d per pixel collisions it would require a demo or tutorial i guess to fully explain. This is basically the meat of the formula. Since each rectangle has 4 points one of them must enter the other rectangle polyhedron such that the rectangles surface vectors all 4 doted against each will yeild 4 positive or negative results the sign of the dot product + or - becomes equivalent to a bool result 4 trues means its inside or 4 false results for any point of one triangle against the other. // this ones my own. // such that i can actually get away with just using the powers to get a ratio. Lines against lines themselves can also be checked for collision. Don't ask me how to determine collisions between two frames for pass thru on this. You would first have to check for the possibility of it. I imagine that would be quit complex for rotating moving polyhedrons to find intersect time between frames. I tried at one point to create such a formula that would calculate that in one shot. At least i began with two lines rotating trying to calculate the intersection time between frames. However no such function actually exists yet as far as i know, and i don't have enough time to spend on it to solve it, if it is even possible to do so. @throbax Thanks for putting my blog post in your list of links! That list seems to have a lot of good resources in it. I think I'll definitely find it useful. 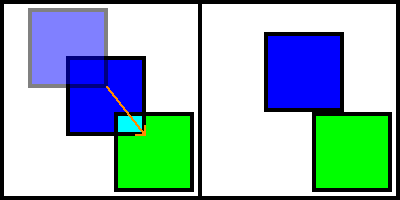 @willmotil So what you described is a way to detect whether two rotated Rectangles are colliding? I don't quite understand what's going on in those functions you posted, though it doesn't help that I'm not exactly stellar at mathematics. And yes, determining the point of intersection of two or more moving objects between frames sounds really complicated, especially if they are polyhedrons that rotated between frames, like you said. So what you described is a way to detect whether two rotated Rectangles are colliding? I don't quite understand what's going on in those functions you posted, though it doesn't help that I'm not exactly stellar at mathematics. The first function checks a point against a plane since a rectangle or most polygons (2d) or polyhedrons in 3d are convex the object itself can form a set of bounding collision planes. In the case of a simple rectangle it is comprised of 4 points. These points from the top left of the rectangle proceed to the top right then down clockwise ect.,, Such that the first two points A to B form a edge line of the rectangle to top edge of the rectangle (from top left to top right (the corners are the vector points), which can also be considered a collidable bounding plane of the rectangles top edge (though we only have its end points to start with). This continues on B to C the right edge C to D the bottom edge D to A the left edge. The function itself takes a start and end parameter for this reason start and end denote the end points of a line but which point we pass as start and end is actually important so we name the parameters to follow that idea. This line which we will treat as a 2 dimensional plane we will want to think of as a real solid surface but mathematically turn that idea into a check we can actually use. This line from point to point is used by the function itself with the thought that it is a descriptor of a 2d surface so to do this.... It takes the line and finds a cross product Vector to get what can be considered a surface normal or creates a right angle point to that line or for us are imaginary rectangle's side surface normal or if you like a perpendicular line to a rectangles side though we will need one per side of our rectangle to do a full check so this function creates them on the fly. It also takes the collision point - the start point to find a direction vector to the collision point it doesn't treat that as if its a plane it treats it as if it is already a seperate distinct surface normal from another object itself. Before i continue i would briefly remind you of the operational results of the dot product. The function will find the following directions. Now if we were to dot these directly to each other to find the theta(angle of difference), the dot(d1,d2) will return a value in the range of -1 to 1 for normalized vectors. The range is not what really matters in our case. Its if you get the negative or positive back. A value of -1 the negative aspect denotes that the two hands of the imaginary clock point in opposite directions. Where a value of 1 denotes they point together in a similar direction. a value of zero indicates that they are perpendicular to each other _|. (which you can image with your right hand pointing in the A to B direction and your thumb then becoming the cross products point, you may then image the starting point of your rectangle with your right hand at the top left of a rectangle pointing to the top right point from there, you may visualize going around to each point to see the cross normal will always point inward for each line and your finger itself forms the surface direction) . Finally then this line of code dots to the collision point minus the starting point (A in this case) that point is not crossed as it is a normal to the point checked for collision, so that is only doted to the cross vector of the line, i have crunched both into one here. This is two operations at the same time which i condensed. It is a right handed cross product of B - A = n0 and then a dot product against Collision - A = n1. These 2 lines below just ensures the math to the modified dot product function comes out right because the dot portion has a addition element negated, and removes the need for a square root here. Normalizing a and b would probably work as well. Note that rotation in this type of plane function makes no difference to how the check is made, since we are working on planes and points directly, regardless of the orientation of them. E.G. you can get the vector points then rotate each with matrix.Tanslate(...)j. You can manually rotate the points if you want yourself it probably cheaper then doing building a matrix ect. Now if we have two Rectangles or polygons each of the points of one can be processed against each line of the other. As soon as one of the test fails to pass the test can end in the case of a rectangle a point must pass 4 line tests to be inside the rectangle. This is the extent of the idea in its brute force form this can be smartened up further it can also be used within a collision grid collision grids can be made to accept polygons even under rotation. The second formula posted is a old line to line test i found on the comp graphics forum. http://www.faqs.org/faqs/graphics/algorithms-faq/ (great algorithm archive scroll way down). I reduced this a little bit but its basically the same formula. You can probably look up 10 or 20 of these line to line intersection tests on the net in a few minutes and find 10 or 20 that are Wrong ! This is a correct version this uses a quadratic to find two possible times of collision. (while this returns a result based on t. I was under the impression you should use the lesser of t or u provided it is not negative). However this pretty much just works. It takes two lines (which could be the sides of two different rectangles) and simply sees if they cross if so it returns true and gives the point of intersection on one of the lines. Whoa. I read through all of that, and, to be honest, about half of it or more still flew over my head. I appreciate the effort you put into trying to help me understand it, though. I added a new blog post with an actual code example of what the first blog post discussed, and an analysis of the code as well. You can find it here. I'll also post the code here. The code is free for commercial or non-commercial use, with no attribution required. /// <returns>The side of the stationary object with which the moving object collided. return velocitySlope < nearestCornerSlope ? return velocitySlope > nearestCornerSlope ? You have to guard against zero division. There is another division in the code with no guard. 2) You may wish to enhance the code to return the remaining vector after the point of collision. This can be used by the caller for things like sliding along a wall, or bouncing off the object with degrees of magnitude. But if it's a corner case, then the horizontal velocity couldn't possibly be zero, or the two objects wouldn't have collided. As for your second suggestion, that could be useful, yeah, but if someone using this code were to need that functionality, that person could add it without too much trouble. I just want to keep my code as simple as I can. See: "2D Collision Detection for Game Programmers: Focus on Circle Collisions" on Amazon.com for a detailed answer to this question. This question is not easily answered. There are 3 types of collision algorithms that may be written: Static, Semi-Dynamic, and Dynamic. Most of the discussions here were for Static collisions. Static collisions are when the algorithm assumes that the two objects are static, or not moving, even it they are actually moving. Semi-Dynamic collision algorithms account for object A moving, but assumes object B is static. Dynamic collision algorithms take into account that both objects are moving. Static collision algorithms return only if a collision has occurred. The programmer only has the location of the objects to use for collision response. This is limiting, but sufficient for many games. Games like "Space Invaders" may be written using the algorithm. It is important to note that the static algorithms can have issues with small fast moving objects. Care must be taken to insure these objects cannot skip over each other in a single frame. Semi-Dynamic collision algorithms return if a collision has occurred, The mathematical intersection point, the intersection time, the collision point (Where the two objects touch), and the collision normal. These algorithms take more time to execute, but return more information to allow for a wide variety of collision responses. This is the recommended algorithm I would use for most games. Games like "Break Out" may be written using this algorithm. Dynamic collision algorithms return if a collision has occurred, the mathematical intersection point, the point where object A is at collision, the point where object B is at collision, the collision point, the collision normal for object A, and the collision normal for object B. This algorithm is the slowest to execute, but gives all the collision response details possible. This algorithm would be suitable to a "Break Out" like game that has multiple ball and if the balls collide they bounce off each other. Typically "Break Out" like game do not have the balls interacting with each other, therefore, the balls can occupy the same location with no response. This is not realistic, but how it is usually done. 2) Create the collision area. 3) Test if the control point collides with any of the objects that make up the collision area. Divide and conquer decisions should be used to maximize efficiency. The collision area is a composite of the 2 objects colliding. To create the collision object take object A and transcribe object A around object B. In the case of a circle colliding with an AABB, the collision area will have 4 circles at its corners, and 4 segments connecting the circles at their outer tangent points. There is insufficient space in this blog give the algorithms in detail, but in the book "2D Collision Detection Algorithms for Game Programmers: Focus on Circle Collisions" will explain all 3 collision types for circles colliding with Points, Lines, Horizontal Lines, Vertical Lines, Rays, Segments, Circles, Ellipses, Axis Aligned Bounding Boxes (AABB), Object Oriented Bounding Boxes (OOBB), Capsules, and Polygons. I highly recommend this book. 1) "2D Collision Detection for Game Programmers: Focus on Point Collisions"
2) "2D Collision Detection for Game Programmers: Focus on Circle Collisions"
3) "2D Collision Detection for Game Programmers: Focus on Ellipse Collisions"
4) "2D Collision Detection for Game Programmers: Focus on Axis Aligned Bounding Box (AABB) Collisions"
5) "2D Collision Detection for Game Programmers: Focus on Object Oriented Bounding Box (OOBB) Collisions"
6) "2D Collision Detection for Game Programmers: Focus on Capsule Collisions"
7) "2D Collision Detection for Game Programmers: Focus on Polygon Collisions"
8) "2D Collision Detection for Game Programmers: Focus on Collision Response"
It's funny how often this pops up since i previously made a seperate post with a example game1 demo ill link to it if anyone is interested in the rotating rectangle collision checks. Note they need not be rectangles they can be polygons. 2d rotating polygon collision example using planes. The code is copy paste runable right off out of the post it will give you the below results. Spoiler: GJK also works in 2D and is always fewer instructions than any known method. All you need is to be able to calculate the extreme-point for any given direction. Pretty sure there's still a prize out there if you can actually beat the Riemannian that GJK is built on.